The rotund rock formations can take the form of the most bizarre shapes when viewed through a layer of hot air rising from the sandy gravel on the banks of Tungabhadra. We stood at the northern bank of the river, on an island called Virupapuragadde, awaiting the ferry that would take us to the ruins of the capital of the Vijayanagara Kingdom, Hampi. It was hot, and Laxmi, the sacred elephant of the Virupaksha temple, was being bathed by her mahout as a horde of tourists photographed her from all sides. Under a stony pillared mandapa built five hundred years ago on the bank of the river sat women who offered their hair in grief, as an honour to the departed. On the eastern side of the bank children jumped into the river from boulders resembling elephant humps, and played in the quieter regions of the rive as River Terns glided overhead, scouring the waters for fish. A day earlier, we arrived on the northern shore of Tungabhadra through banana and sugarcane crops planted on rich black soils surrounded by giant ochre rocks that piled high one upon the other in some places, and which in the evening sunlight turned to gold. These golden rocks are the hallmark of Hampi, on which mankind has written in stone its rich cultural and natural history. Hampi is an ancient city dating to 1 or 2 century AD, but its cultural glory was at its peak during early 1300s when the Vijayanagara city was formed by the Sangama brothers with Hampi as its capital (Vasudevan and Muralidhar, 2015). The cultural height of this city was at its peak during the era of King Krishna Devaraya, who ruled the Vijayanagara Kingdom for two decades; some consider his reign as the epitome of the glory of the empire when many wars were won, and history written in stone. Even more ancient is its association with Ramayana, where the north of Hampi is the location of the Monkey Kingdom Kishkindha, ruled by Sugriva, and the Anjandari Parvata, the speculated birthplace of Lord Hanumana. It is said that this area formed the southern edge of the ancient Dandaka forest that extended from the Vindhyan Range of mountains to the River Tungabhadra where Rama and Sita wandered in exile. Within this forest lay the Dandaka Kingdom, said to be reined by Rakshasas, the demons, whose king, Ravana, abducted Sita. Lord Rama had come to the Kishkindha Kingdom in search of Sita, where he received assistance from Hanuman. [Source] [Much of this is inconclusive, as many records have no accounts of the Dandaka forest touching the River Tungabhadra as far as the Kishkindha Kingdom in Hampi]. The history of this place therefore speaks volumes – from the mythology of the (Valmiki) Ramayana written in 5 to 1 BCE [Source] when the ancient Indian forests of Dandaka existed, to the empire of Vijayanagara (1300 to 1400 AD) known for its taming of elephants and trade with foreign empires, to the present day (2015 CE) when we look back and marvel at all that existed. Perhaps the only link between these three extended time periods could be explained by the flora and fauna described in them: who were the rakshasa, the narsimha, the vanara, the yali, the makara, and if all of these are mythical, do they symbolise anything that ever lived? Was there a kingdom of monkeys, did the Bear King live here, was this land once home to the tigers, did wild elephants ever roam these lands? The reek of guano inside the 14th century Prasanna Virupaksha temple was strong. Only a moment earlier, we asked our guide Vikram that we wanted to see bats – and as we came to a stop alongside this temple, he said this is exactly where you’ll find them! This ancient temple, now popularly called the Underground Vishnu temple, shares its architectural intricacies with many other temples around: stone pillared with many aisles, and a corridor that leads deep inside into darkness. Much of the temple was filled with ankle-deep water, and although its waters reflected the dark roof of the temple, we thought it would be filled with the guano ever since bats had colonized it. But we had to see who dwells inside this holy temple after the idol was taken away. In the back of the temple there is a small opening which takes you to the middle passage, which further leads inside into the garhbagriha cloaked in utter darkness. And in and out of it fly the silent-winged, broad eared bats – the Schneider’s Leaf-nosed Bat (Hipposideros speoris). 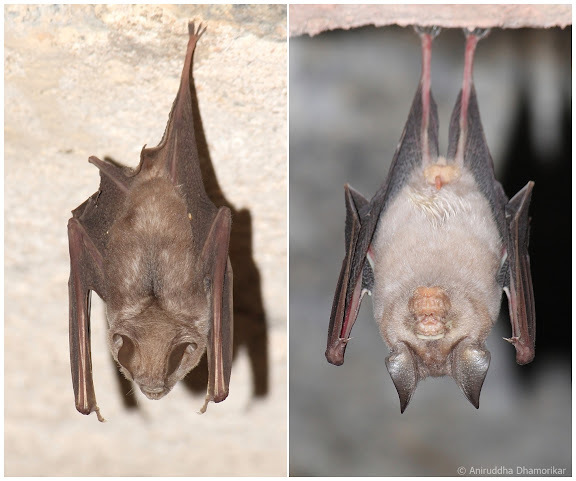 These small, insect-hunting bats found only in India and Sri Lanka, are common inhabitants of the temples of Hampi, and are perhaps the oldest residents of this temple today. We are not sure how many inhabit the city of Hampi, or for how long they’ve been around; in fact most visitors remain oblivious to their presence, or feel disgusted at the smell and sight of them – but they’re not parasites damaging what our ancestors built – they are eating insects such as mosquitoes – thousands and millions of them every night – and keeping their numbers in check. The ones that lived in the natural caves of Hampi much before it rose to become a city, and in manmade stone walls chiselled out of stone, are missing from the records, but still clinging onto those very same stones. No bats are carved on Hampi’s stones, but its walls have several stories to tell: tales of tiger and leopard hunts, taming of horses, camels, and elephants, and creatures that sadly today exist only in stone in this ancient city. We climbed the Anjanadri Parvata in dizzying noon heat, and gazed upon the idol of Lord Hanumana which appeared a lot like an infant moorti of the lord – and then stood at the edge of the hill to look upon the southern landscape. The horizon was spilled with boulders of every shape and size, forming either blunt or pointed hilltops, their skin tanned bronze by the sun. The Tungabhadra formed a wide bed of lush green plantations hugging from all sides: rice, banana, sugarcane, coconut; and she occupied only a fraction of her once vast fertile plains as she steadily carried herself towards east. The Virupaksha temple, a tall grandeur and the main complex of Hampi, is barely visible in the vast landscape. It is here that culture and nature converged, and led to an everlasting impression on mankind. It was a masterpiece of unnatural beauty and splendour, sterile yet fertile, empty yet occupied, Martian yet Earthly. It is said that the rocks of Hampi are the bare bones of our planet visible to the naked eye, giant granite monoliths that crumbled as they aged under forces of sun, water and wind [Source]. Hampi is as beautiful up close as it is from a hilltop, its pillars and its walls that form giant temples are carved with stories of a forgotten past. The Hazara Ramachandra temple, so called because of the depictions of relief sculptures of Rama in the Ramayana narrative (Vasudevan and Muralidhar, 2015), depicts series of several stories: of warriors practicing, of horses being tamed and presented to the king, and elephants pulled, rode upon, and trained for war. The depiction of taming of animals such as horses, which were brought in from Persia, are worthy of note, but more worthy are the depictions of the domestication of elephants. I did not come across records of where the Vijayanagara Kingdom acquired elephants – were they around when the kingdom was in its prime? Or were they captured from the Western Ghats that are not too far from Hampi? The only reference to elephants is that of King Devaraya II, who was titled Gajaventegara, the hunter of elephants. Kuntar (2012) states that he was an expert at hunting elephants, however Chopra, Ravindran and Subramanian (2003), as quoted in Wikipedia, said that it could also mean a metaphor for his “victories against enemies who were as strong as elephants” [Source]. We can only speculate whether wild elephants existed around this landscape or not – the historical range of Asiatic Elephants however suggests that they did, and could have been the source population of domestic elephants as well. They fought wars, transported rocks and kings, and pulled chariots. No wild elephants roam these lands anymore; Lakshmi is probably the only domestic elephant that lives here in the Virupaksha temple. The closest range of wild elephants today lies towards the west, in the Uttara Kannada district. The most intriguing sculptures besides the mythical beasts are that of hunts: men wearing turbans sitting on the backs of elephants or horses hunting tigers and leopards with spears. This depiction of tigers, horses, and elephants all together are unlikely to be borrowed arts, they were probably inspired by first-hand experiences of hunters in the countryside of Hampi. An interesting rock art on Mahanavami dibba is that of a male tiger attacking a domestic elephant, with a man standing under the elephant stabbing the tiger’s stomach, and another man on a horse, probably a king or a prince, spearing the tiger on its shoulders. It is unclear if it was a staged artwork or the depiction of an actual hunt narrated by a hunter, but there are several relics showing men on elephants or horses hunting large cats that could only mean tigers. We came across another such artwork where two men are in a forest on foot, one with a spear, and one with a a spear stabbing a cat that perhaps represents a leopard. And of these three giants – the elephant, tiger, and leopard – of an era gone by, only leopards seem to have remained amidst Hampi’s rocks. Steve, who runs Bobby “One Love” Guest House and Restaurant, saw a leopard a few months ago towards the north of the Virupapuragadde sitting amongst rocks, and watched him dissolve into the stony blanket as soon as he was spotted. Hunting was apparently common in the Vijayanagara Kingdom, tigers and leopards were hunted for sport with spears, and deer were hunted for food. Walls of ancient temples tell stories of hunters with bows and arrows hunting deer. A series depicting hunting is preserved well on one of the sides of the Mahanavami dibba. Carved on the bottom slab of the wall, it shows (from left to right), a hunter with a bow and arrow shooting a chital, two people carrying the shikar on a pole, and another party attacking another herd of chital. Men hunting deer are a common feature of stone art, we saw a depiction of what appears to be a pig (most likely a wild boar) cowering from a hunter as a herd of chital dashes into the forests. The hunter however appears to have killed a deer just above the boar. I wondered why they would show a boar in a hunt scene, for it is considered holy. The boar depicted on the royal emblem of the Vijayanagara Kingdom stands for Lord Vishnu’s third avatar Varaha – a boar – who pulled the earth out of the water when Hiranyakasha hid it deep under the ocean. The most iconic of all stone-carved temples is the Vitthala temple, standing alone in its own temple complex with an intricately carved stone chariot being pulled by two elephants resting in front of it. We explored this complex as the October sun baked the ground beneath our feet, and dust settled on our skin. We walked towards the northern door of the Vitthala temple where an old Plumeria tree stands, and towards the southern end of the complex is an empty temple with a flat roof. Inside it was complete darkness, and a small roost of another species of bat, the Lesser Mouse-tailed Bat (Rhinopoma hardwickii) dwelt here. A rather small species with large eyes and a peculiar mouse-like tail, these insectivorous bats occupy similar niches as the Schneider’s Leaf-nosed bats. The temple they roost in is seldom visited by tourists, this deep and dark space is their sanctum sanctorum. Many of these temples are adopted abodes of wildlife. Amidst the clamour of wars in the mid 1500s, an Italian visitor Caesar Freedericci is quoted by Kuntar (2012) as remarking, “the town had become desolute [sic] and buildings in it had become hide-outs for wild animals”. This is perhaps the only reference to the wildlife that existed during the time of the Vijayanagara Kingdom. On our way back to Bobby “one love”, we saw a flock of ruby-red Red Avadavats mixed with the dark-browns of Scaly-breasted Munias pecking the ripe heads of rice. In the morning, was saw a Red-vented Bulbul fledgling being looked after by its parents, a mother Baya Weaver dehusking rice and feeding the white grain to her fledgling, and Silverbills, Bee-eaters, Kingfishers and Drongos hunting among the stone hills. A number of rock agamas, a lizard that lives only on rocks, chased one another among large boulders. Were these some of the only remaining resilient species that now called Hampi home? Vikram, our guide during our stay at Hampi, informed us that only recently a leopard was captured and moved away from the locality by the Forest Department because it was a potential danger to people. The only signs we saw of leopards were the nail collars worn around the neck of pet dogs. Sloth bears, although now uncommon, have been spotted by people, snakes such as cobras, vipers and sand boas are also commonly found around Hampi. Other species of bats such as the Indian flying fox (Pteropus giganteus), Indian pipistrelle (Pipistrellus coromandra), and Leschenault’s rosuette (Rousettus leschenaulti), are recorded from Hampi. The fingers that chiselled these rocks, which have preserved parts of their kingdom for eternity, perhaps overlooked these common forms of wildlife which, I think, they thought would linger on long after the era of the kings had ended. Perhaps their cultural value was negligible; perhaps they were far too common to be worthy of being carved in stone. This life today is hidden under the extravagance of Hampi’s tourism that has rerouted and reformed and reshaped Hampi’s relationship with nature. And we’re increasingly seeing a shifting of the baseline of the ecology of Hampi: from the time when elephants and tigers roamed these lands, to today, where they can only be admired in stone. My thoughts kept going back to how things would have been then. We reminisce Hampi’s manmade past, with no reflection on what has been lost ecologically. Our awe tilts more towards the economic history of the region, with little or no consideration for its ecological history. This kind of Shifting Baseline Syndrome that we suffer from is aptly classified as “generational amnesia, where knowledge extinction occurs because younger generations are not aware of past biological conditions” by Papworth, Rist, Coas, and Milner-Gulland (2008) in their beautiful study Evidence for shifting baseline syndrome in conservation. The current conservation measures of Hampi lie in the mitigation of man-animal conflict with the scant wildlife that still clings to its rocks – leopards, sloth bears, wild boars, snakes. This does not translate into bringing the lost glory of Hampi back – its rocks now lie empty for most parts – no longer do they feel the warm soles of mammals resting on them like they once used to. Over 30 kilometers from Hampi is the Daroji Bear Sanctuary (see management plan here), a small, 82.72 sq. km. wide sanctuary carved out of rocks and stones. It is particularly famous for its conservation of sloth bears. Most of these bears are rescues, which are fed with jaggery, bananas, honey, and other sweets daily. Two men, one armed with a stick and another with a vessel climb up the flat platform-like boulders and spread the sweet brew onto the rocks daily. The man with a stick in hand is in-charge of making enough noise to inform any prowling bears of their presence. As the day progresses, bears, mongoose, peacocks, spurfowls, and wild boars come out to cherish this free treat that they’re feeding on since Daroji came into existence in 1994. Daroji is a scrub forest with relatively good tree cover compared to the heartland of Hampi. Leopards take shelter in this protected area as well, perhaps feeding on the resident bonnet macaque and southern plains langur. Although most of its sloth bear population is habituated to the free diet provided by humans, there are several wild individuals that rarely ever wander out during the hot afternoon hours. I find Hampi and Daroji to be two peaks of the same mountain. They share the exact same habitat, are thinly populated, and can hold a large population of wildlife – not only of sloth bears and leopards, but also, perhaps, of tigers if not elephants. The conservation choices of Daroji Sloth Bear Sanctuary are peculiar, they are a combination of ex situ conservation measures (artificial feeding) in an in situ conservation model (in their natural habitat), a rare method that works well for bears whose populations are decreasing throughout their distribution range. From an ecological point-of-view, Daroji is a highly unstable colony of sloth bears, since bears are solitary animals and converge only when food is abundantly available. How does this relate to the Shifting Baseline Syndrome? Shri Jambunatha temple is located a little farther from Hampi, about 5 km from the city of Hospete, on a hill called Jambhunathanahalli. Jambhunatha is the King of Bears, the son of Brahma, and is depicted as a sloth bear (read the history on Wikipedia). Jabhunathanhalli literally means the dwelling place of the King of the Bears. Daroji Bear Sanctuary was perceived to be a place for the conservation of sloth bears with several measures undertaken to give them a safe haven and reduce anthropogenic pressure upon the protected area. The historical link of the surviving, or rather thriving, populations of sloth bears with that of the 15th century temple of Jambhunatha, or with the hill upon which the King of Bears dwelt, is hard to overlook. Perhaps it was deemed that sloth bears needed protection because the King of Bears dwelt here, or perhaps the ancient civilization dubbed this hill so because many bears already dwelt in that region. What, then, of the tiger that was hunted for sport; or that of the elephant trained for labour? What of the Great Indian Bustard that were recorded in this region until recently but are now locally extinct [Source], and are critically endangered and on the verge of extinction solely because of man’s activities? We have now reduced the biodiversity of Hampi to only those animals that can eke out a living in a human dominated landscape. Walking through the ancient temples of Hampi, we feel a strong presence of men roaming through those empty stone-walled temples over 500 years ago. But if you look a little closer, Hampi’s history offers glimpses of its natural riches too, which will remain written in stone for another several hundred years for everyone to see the glorious years of yore now but a memory. We sat on the shoulder of a rock in the evening sun wondering if we could spot something as we scanned the large hills glowing in gold around us – would a leopard be peering at us, or a family of bears patiently watching us from a cave – but all we heard was a group of visitors singing in unison to the setting sun. Wow! 'Looked' at Hampi from the ecological point of view for the first time. Thought provoking post.